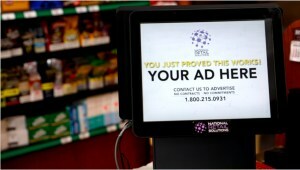 National Retail Solutions (NRS) is leveraging its point-of-sale (POS) terminal network to display consumer-facing advertising in bodegas and other independent retail stores nationwide. NRS retail terminals feature dual facing high-definition monitors; the customer-facing display shows a split screen during transactions. One half displays the register tape, and the other various offers and promotions from advertisers (including consumer packaged good (CPG) providers) on the other. Before and after a transaction, the display rotates both static and video advertising at adjustable time increments. There are 2,500+ stores already participating in the NRS retail advertising network, offering consumer package goods providers and other advertisers reach into hundreds of thousands of customers a day, primarily in urban, Hispanic and other ethnically focused markets.